One of the club’s colorful cottages for rent. 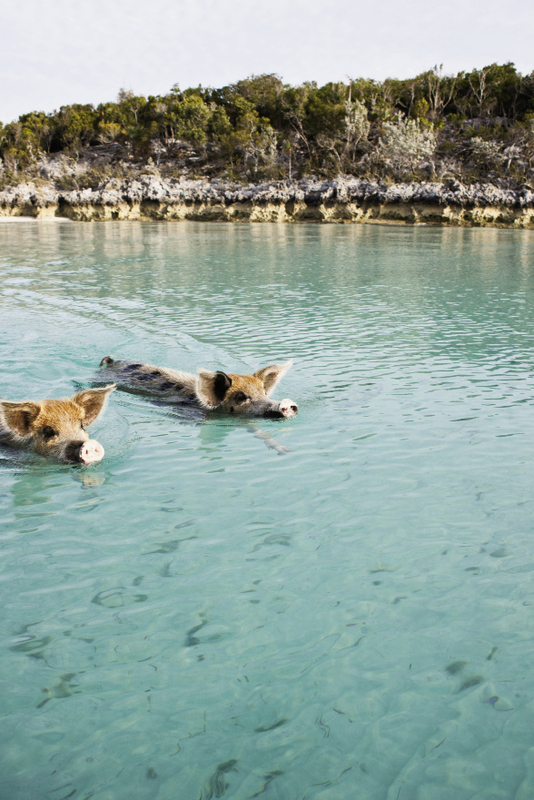 The famous swimming pigs roam free on an island near Staniel Cay. 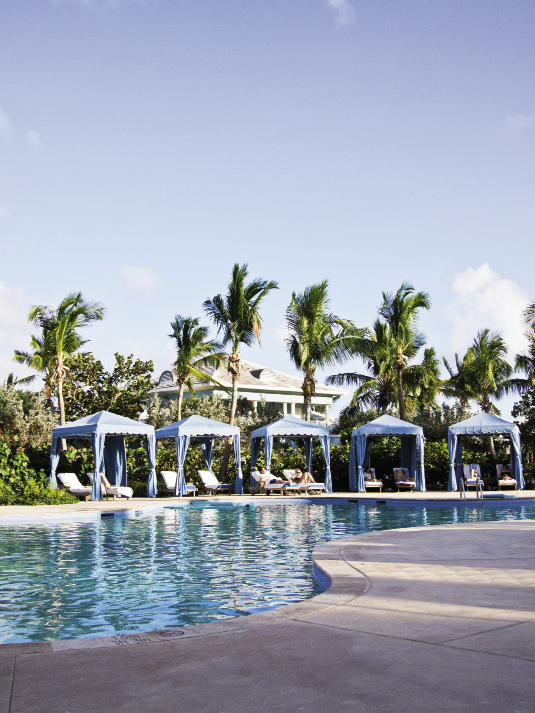 Of the resort’s three pool areas, the tucked-away “quiet pool” offers the most relaxation. 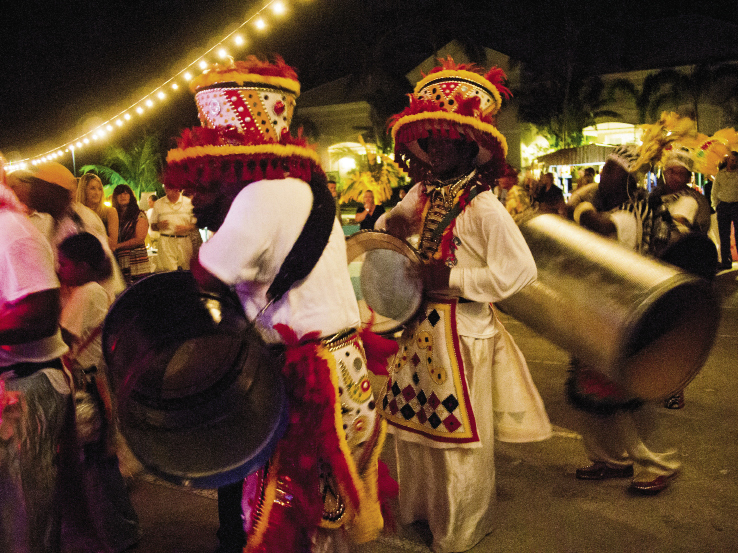 A Bahamian Junkanoo parade fills the Exumas’ night with music and color. Somewhere north of Cuba and southeast of Nassau, we’re about to land on a small island, or cay (“key”) as they are known in the Bahamas. In recent years, movie stars and other celebrities have begun to buy these private and secluded coral and sand “out islands” of the Exumas. The captain of the small snorkel boat explains that Nicholas Cage purchased an island here several years ago, and that Johnny Depp owns another nearby. Scanning the beach, I don’t see a house or development of any kind, and then, from somewhere beyond the dunes, the local wildlife begins to appear. A couple dozen brownish-pink, Bahamian rock iguanas scamper toward the shore as our boat approaches. Some of the dragon-like creatures must be at least a yard long. They seem to know that the captain has something for them—and he does, a couple bags full of carrots that he tosses to the large lizards to munch. The eight of us who are passengers on the day cruise hop off the boat and into the clear, shallow water that’s meeting the shore with very little wave currents. 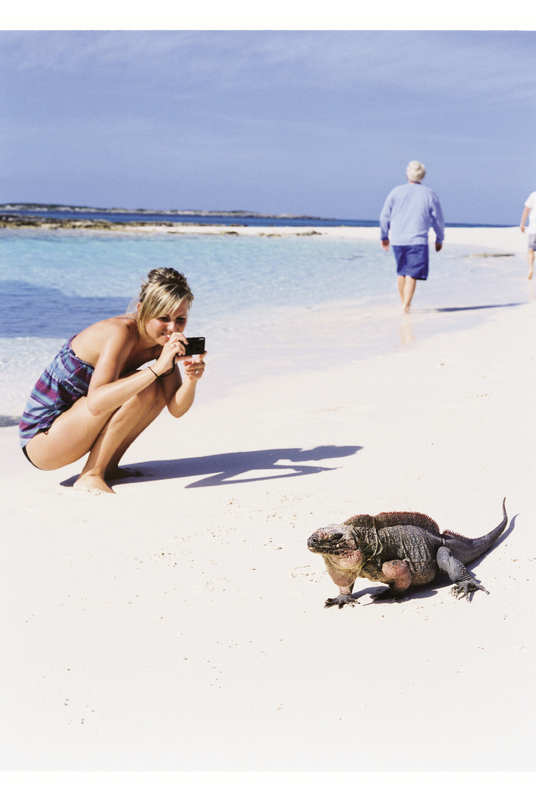 The iguanas sidle up with wide, cautious steps to anyone with a carrot in hand. It’s an amazing sight, considering that the captain says the population of these native lizards is estimated to be in the hundreds. Also amazing is the fact that we’re all dressed in shorts or bathing suits on a balmy day, and it’s January. 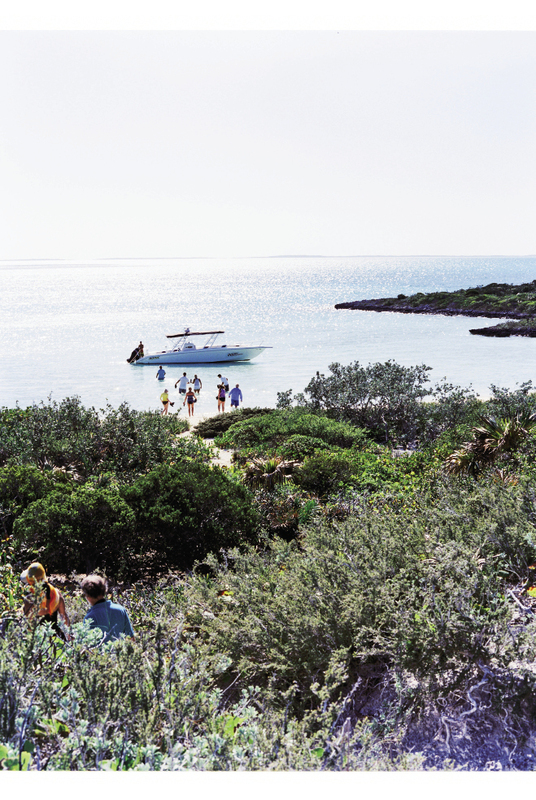 Natural wonders, clear water, and warmth—that’s the Exumas. (And depending where you stay, trips to this part of the world may also include endless cocktail service by the pool.) 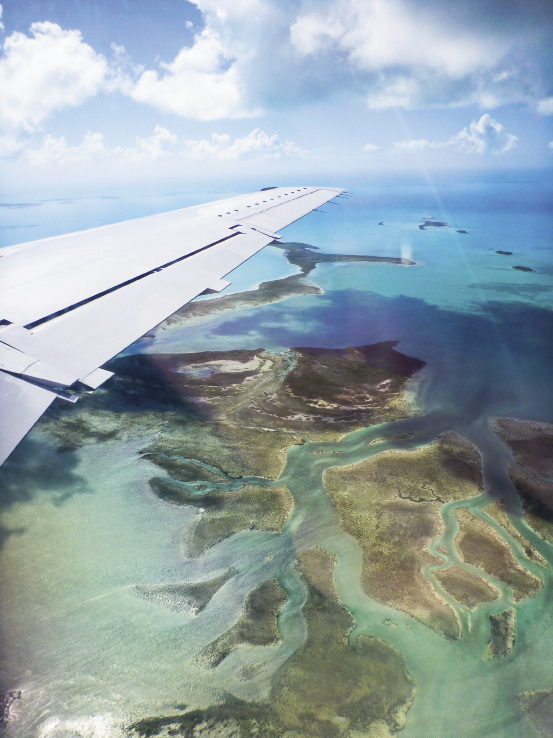 For our winter getaway from Charleston, we catch flights connecting through Miami to Great Exuma, which at some 37 miles long is the largest of the more than 360 cays in the Exumas. “That’s one cay for almost every day of the year,” says the taxi driver who picks us up from the airport near the island’s capital of George Town. As we pull away from the modest, municipal-style landing strip and then pass miles of rural, undeveloped land, he talks on about the fantastic time we’ll have in the 120-mile-long chain of islands and the beautiful beaches that “are never crowded, like in Jamaica.” (Turns out that this driver, like many of the service industry employees we meet on the island, is Jamaican-born.) We pass no stoplights on the easy drive. And at some point, Johnny Depp’s name floats through the car when the driver mentions some nearby filming locations of Pirates of the Caribbean. On prior trips to the Bahamas, I’d experienced the name-dropping, although I’ve yet to see a celebrity. The likely story is that when they are here, their money buys them total privacy. Having just admired the sparkling necklace of islands from the air, it doesn’t seem that it would be too difficult to be elusive here. Maybe that’s what we’ll do, too—disappear from the rest of the world for a few days, surrounded by the warm and shallow, crystal-blue water. 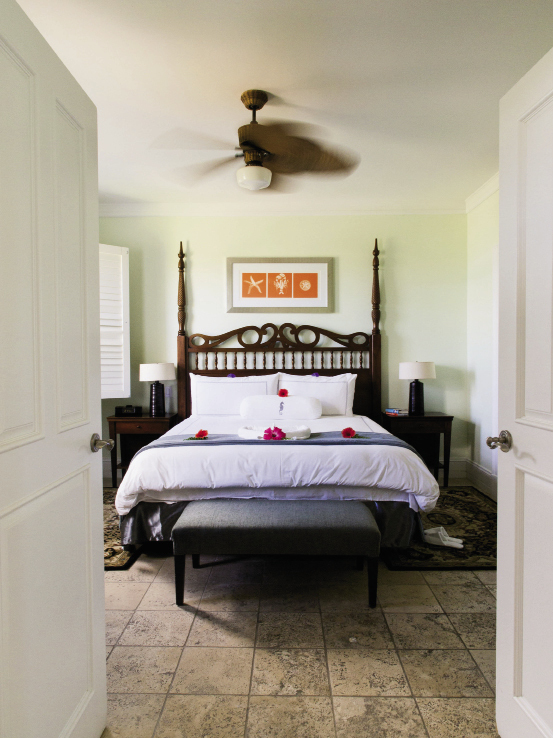 Soon we’re checked into our lodging at Sandals Emerald Bay, a 500-acre compound (formerly a Four Seasons property) that’s overflowing with bougainvillea, plumbago, and oleander in reds, pinks, and blues. Beyond the green tangles of sea grapes, I glimpse a spectacular Greg Norman-designed golf course that I’m told is challenging enough to cause plenty of lost balls in the dunes. 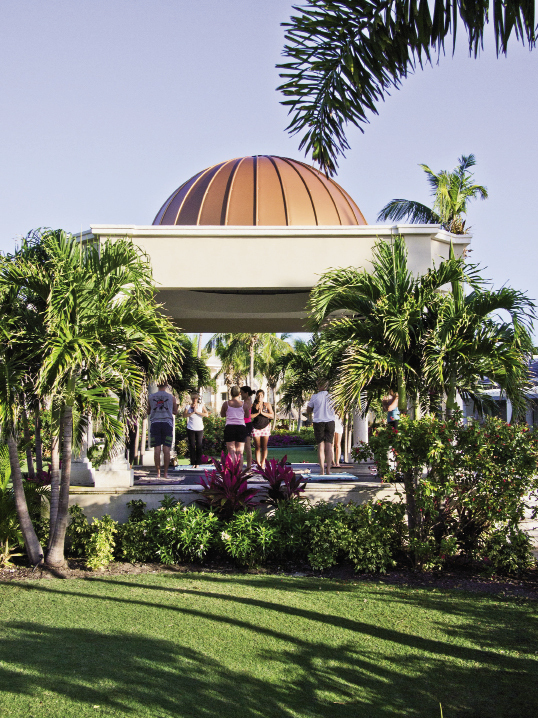 This couples-only resort is the kind of place where neatly uniformed staffers seem to be at every turn, doing some kind of cleaning and service, and where the concierge or any other staff-person you meet more than once addresses you by your name. The first time we finish a meal and realize there will be no bill to review, and not even a tip to calculate, my trepidations about an all-inclusive resort vanish. Such costs have been figured into the room rate. Whatever you eat or drink inside the gates of the 245-room resort with three pools and a spa—it’s all included. To adjust to the climes and properly experience the place, we spend most of one day poolside, relaxing on cushioned chaises that are as big as queen-size beds. A retractable cabana awning provides shade, and now and then a server stops by to offer, say, a mint-passion fruit smoothie or some brightly colored cocktail. In the afternoon, I decide to break away from lounging and walk over to the spa for a West Indian Massage, a full-body rubdown that includes—my favorite part—a beach-sand foot scrub. I leave the spa feeling even more unwound and emanating a light essence of lemongrass. Our first stop is a very narrow, unpopulated cay where the waves crashing against the backside of the island repeatedly force seawater through a coral cave, blasting it out of an opening in a huge whoosh and spraying mist several yards into the air. We expected nothing more than a pretty boat ride, but the day of natural phenomena continues. The captain idles the engine when he sees one of the hubcap-sized, golden sea stars (bony, five-pointed starfish), and with a wink to his son, he disappears over the side of the boat in a dive to fetch the creature so we can all see and touch it. Back at the wheel, Captain Ray points out stingrays—some look as big as a man. The dark, tailed silhouettes skim across the white sand bottom. We stop, and the boat hovers near a nurse shark that’s bending its body back and forth as it swims—practically sashaying—through the water. 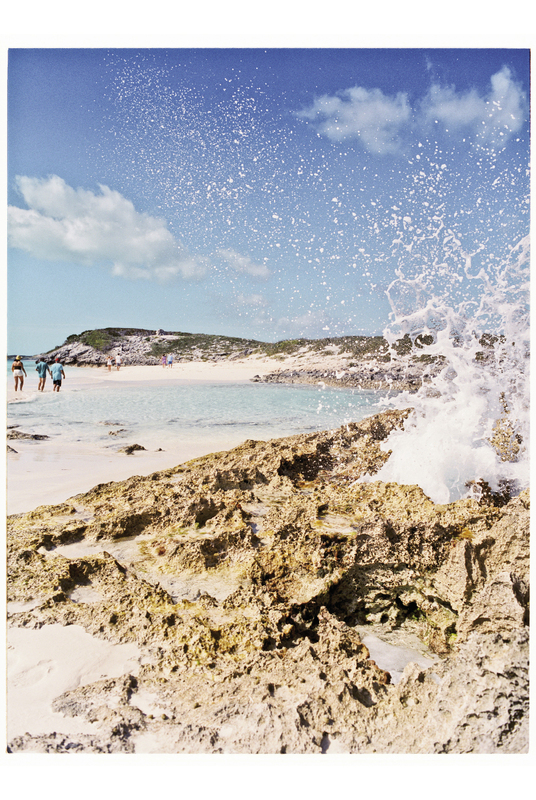 We climb onto a cay and follow a rocky trail to surprisingly elevated, cliff-edged views and waves splashing below. And later in the day, we look down from the boat at a point where the captain shows us a deep blue hole that’s popular for free-diving (no scuba gear), with divers seeing how far and deep they can go. The visibility is incredible, and I feel like I can look for miles into the watery center of the earth. And, of course, we are witness to the marvel of Nick Cage’s beachfront of rare and hungry iguanas. 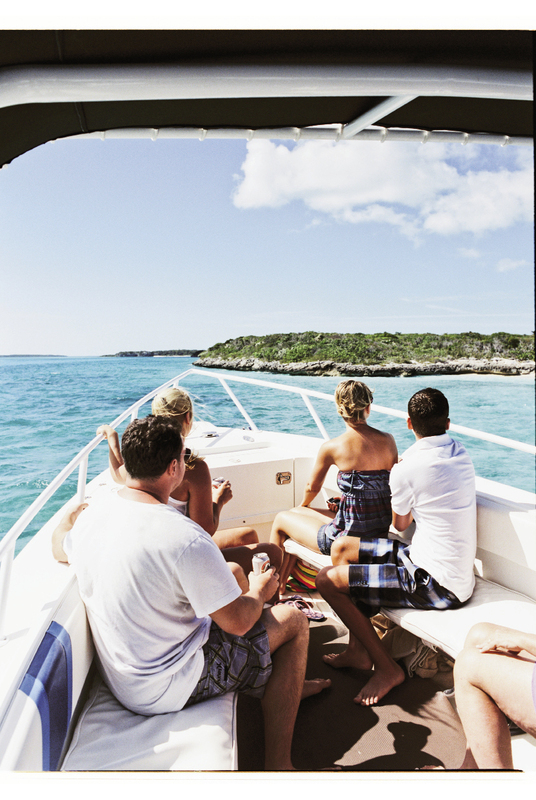 Another bright Exuma day, on another boat, we cruise over to the Staniel Cay Yacht Club, a marina and pub known for its conch fritters. After we eat our fill under rafters hung with nautical flags in every stripe and color, the proprietor, David Hocher, offers to show us a few of the club’s cottages and suites that are available for nightly and weekly rentals. 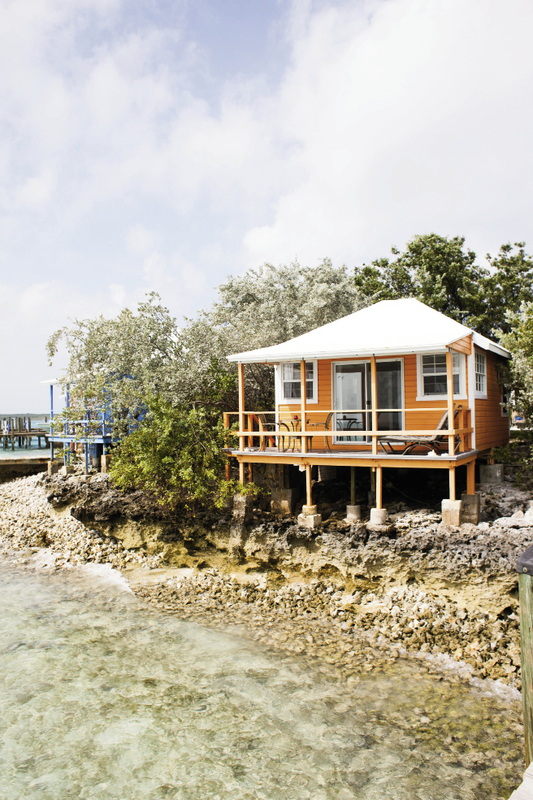 Each is painted and named for a color, including key lime, periwinkle, orange, yellow, and lavender, and some of the cottages are perched directly over the water. The use of skiffs—we saw plenty of 13-foot Boston Whalers—can be included in the lodging rate, with docking just outside. On a short boat ride from Staniel Cay, we swing into a bay to see the famous swimming pigs. Like the iguanas, these wild hogs respond to approaching boats, but these animals swim. I don’t think I’ll ever forget the pink-skinned hogs running and squealing across the beach and then jumping snout-first into the saltwater. At first, the spectacle is amusing, but when the most vigorous of the boars rise up by the boat looking for food, my mind flashes to images of the gaping maws of hungry sharks. We finish the day with a wonder of an entirely different sort. Not surprisingly, this stop, too, is related to films and celebrities. 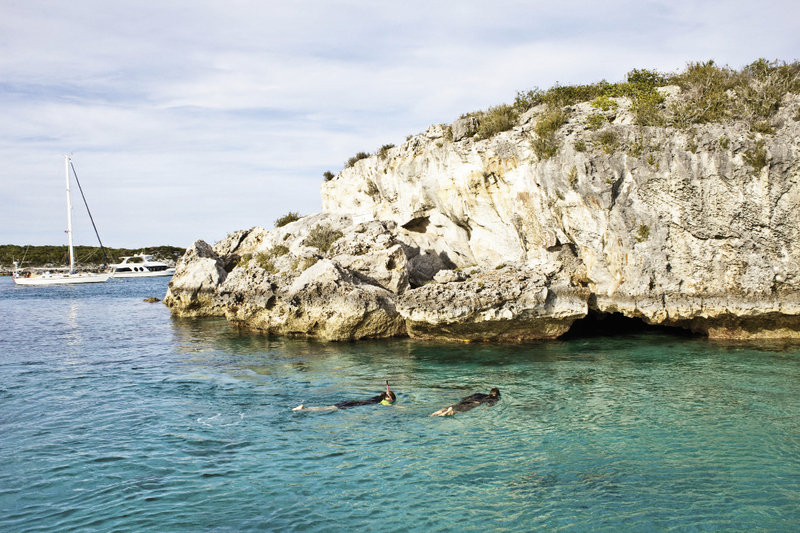 We motor up to a rounded mound of coral rising out of the ocean that’s protected by the Bahamas National Trust as part of the Exuma Cays National Land & Sea Park. Known as the Thunderball Grotto, it’s named for the 1960s James Bond movie Thunderball and the famous underwater cave scene filmed there. During a slack tide, the water level lowers enough to allow people to snorkel under an arched opening in the coral. I pull on flippers and a mask and swim in through the choppy water while tropical fish stream past and nip at my elbows. I’d heard that the pay-off would be great, but this is awesome—as I emerge, a tall dome of coral is overhead, with openings in places allowing sunlight to stream in and water to drip through. I’m spontaneously saying things like “wow” and “incredible,” and I hear my voice echoing in the natural cathedral. Before long I start to pay attention to how the current is washing water into the cave, and it takes some good and steady kicking to swim back out and meet the boat. On the final night of our stay, the resort hosts local food vendors, musicians, and dancers in a small festival on the grounds. It’s all set up like a street fair or Caribbean fish fry with a line of booths dishing out conch chowder, fried fish, and peas and rice. Tables and a stage are at one end, and a rendition of a Bahamian Junkanoo parade gets rolling at sunset. I’ve seen a few of these costumed dance performances on past trips to the Caribbean, and this is a good one. Dancers are in glittering costumes with beaded headdresses in the style of a Mardi Gras parade. Young men pound drums as they walk, and the beats reverberate through your body, instantly making you part of the scene, too. A fire-eater swallows flames, and guests join the dance in a sparkling finish to days on an otherwise tranquil island. 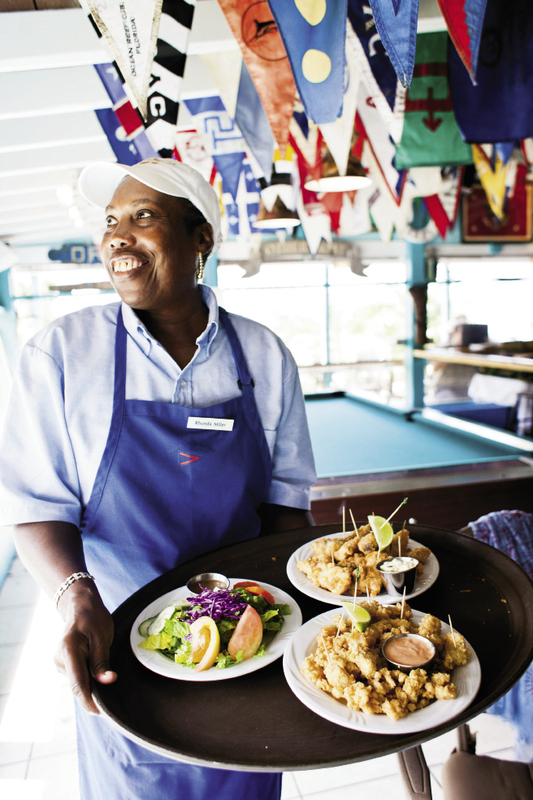 We see no famous stars during our visit, but the island’s people and natural gifts sure do shine. 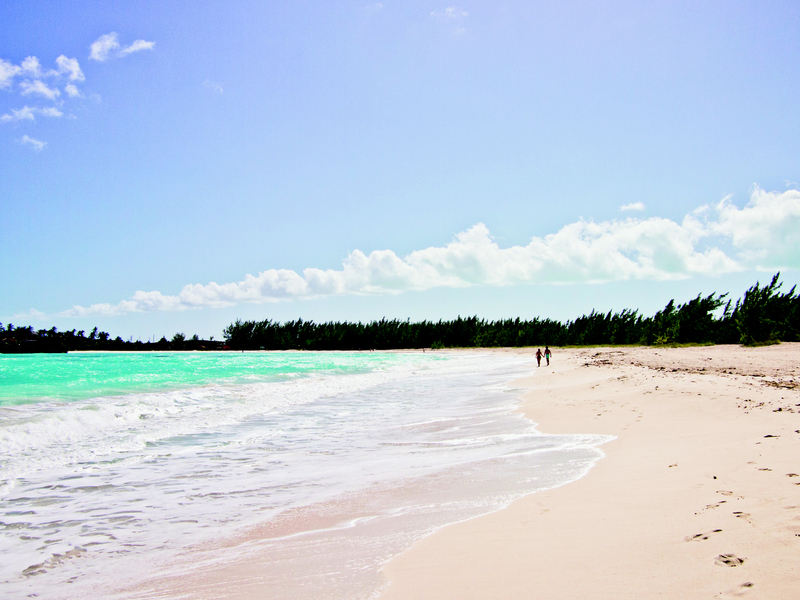 Exuma International Airport (GGT) is served by USAir, American, United, and other airlines, as well as charter flights by Watermakers Air from Fort Lauderdale, Florida, to Staniel Cay. 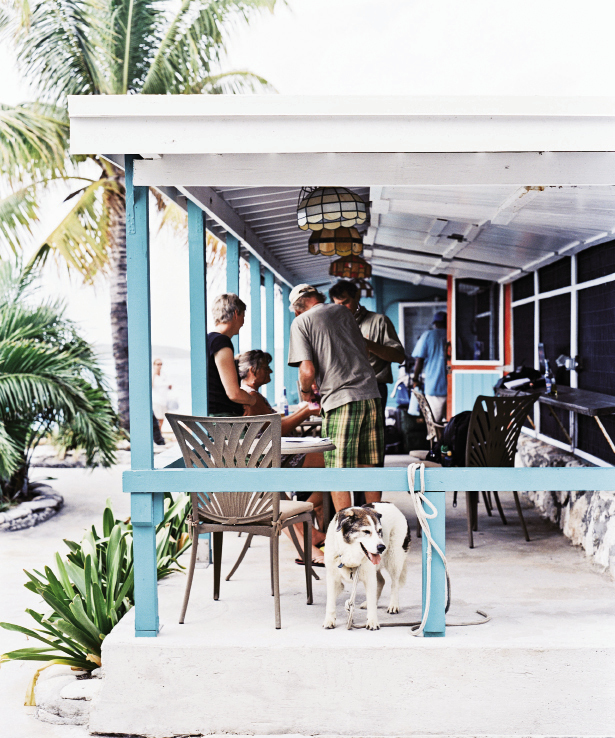 Centuries-old salt ponds still exist, and artisanal producers like the Exuma Salt Company sell it loose and in other products at roadside markets or hotel gift shops, exumasaltcompany.com.